Hi, I am interested in your 1962 Chevrolet Corvette (stock #5080-CHA) listed on Autotrader for $46,995. I'd like to get more information about this vehicle and confirm its availability. 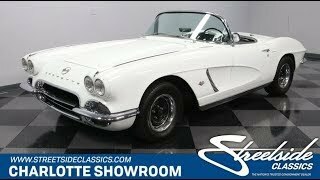 This 1962 Corvette has a very cool custom attitude that is nothing but white, black, and chrome. So while every first-generation Corvette is iconic, this has that extra hint of distinction we all love. This was the last year for the first-gen Corvette. That meant a smoother style with a ducktail rear end. So it seems like the right place for a bit of a sporty upgrade. After all, the white paint with black steel wheels strikes the right balance of timeless style with a hint of racecar appeal. Plus, the 1962 cars deep grille opening and upgraded tinted taillights even add to this cool dark side. While there have been some custom touches, they didnt mess with the brightwork that makes this a true classic American. You have a complete package with the intricate front end, two-piece chrome bumpers, ribbed rockers, and full trim including up the fenders and around the windshield. There is a color-matched white hardtop to give this a coupe-like profile, but we really all know that a C1 deserves to be open to the world. In fact, the full black interior really sets this car apart as it coordinates with the exterior accents. Bucket seats, a deep dual cowl dash, and artful trim are all what you love about this first generation Corvette. When you slip behind the three-spoke sports steering wheel, you feel the kind of old-school grip that lets you know this is a classic sports car it really gets your heart racing. They even customized the engine bay to keep this cars color theme. After all, with the block, intake, and exhaust manifold finished in black, it really drives home the dark side accenting of this Corvette. Plus, it earns some aggression now that the 283 cubic-inch V8 is inhaling deeper with a Holley four-barrel carburetor. The dual exhaust gives a sweet tune, and you can really feel the lightweight nature of these early Corvettes once you get them on the open road. And the Powerglide automatic transmission lets you enjoy it all with ease. We have some restoration photos proving there was a careful eye taken a while back to create this total custom color package. Today that makes for distinction you can drive now, and a value price which you can use to take it to the next level if you so desire. Call now!